HELLO! Can you hear me? I can't see you .... can you see me? Have you ever asked these questions when you've joined a Google+ Hangout? Sometimes, you may experience some sort of an audio or visual issue when you join a Hangout session. In today's blog post, we'll discuss the steps (Google recommended best practices) that need to be taken to properly troubleshoot your audio & visual issues. First, you'll want to make sure that your microphone & webcam are properly plugged in to your machine. We know it sounds simple, but you'd be amazed at how many times issues can be resolved by double checking connections. Second, ensure that neither your microphone or webcam are being used by another application. Typically, you cannot be in more than one program that requires the use of your webcam or microphone on the same machine. 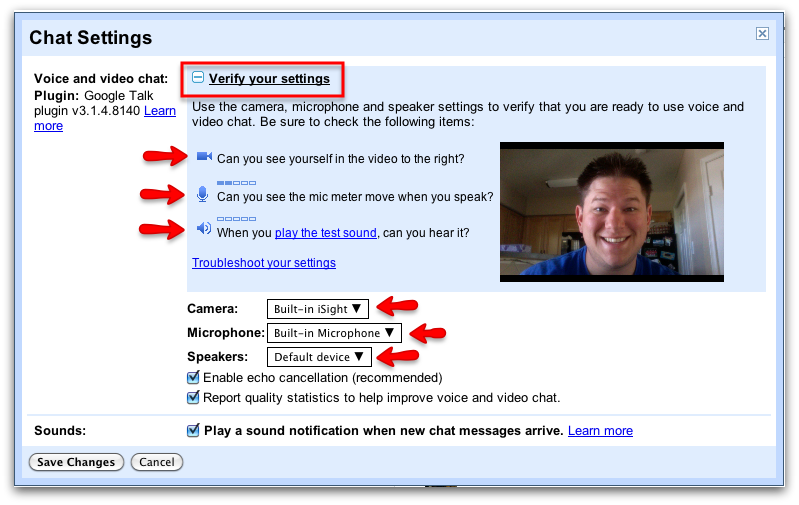 Third, verify your settings to make sure the plug-in is using the correct webcam and microphone. 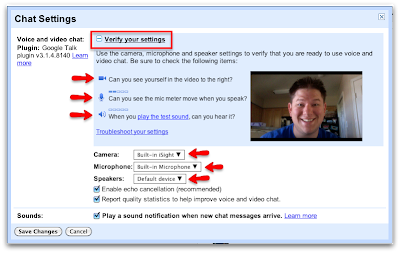 If your microphone or webcam shows up as "USB video/audio device," try installing a specific driver. From within the Google+ Hangout, click on the 'gear' in the upper right hand corner of the Hangout. Notice in the image above the options to choose the correct camera input, microphone input, and speakers. You may have more than one option for each of these settings ... you can select the different options and test until you find the correct setting. This can be verified in the testing panel above the options screen. Fourth, you can always exit the Hangout and rejoin. It could be that you may be experiencing a small technical glitch during the specific hangout session. Closing the session and the rejoining may be the perfect fix! Fifth, you may want to restart your computer. It's the oldest trick in the book but, sometimes the most useful trick! It's kind of like clearing your cache & cookies in your browser if you are experiencing issues browsing. Sometimes, it's the simple things in life. If you have taken the steps listed above to troubleshoot and you are still experiencing audio & visual issues in your Google+ Hangout session, you can always report your problem to Google. Here is a video of a few troubleshooting tips. We hope that your Google+ Hangout sessions start and end with no issues at all but if you do come across a problem, you can always refer to this blog post for the necessary steps needed to troubleshoot on your own. If you have any helpful tips & tricks or personal stories of your issues, feel free to share them with us in the comments section below. Also, if you found this post fun and informative, give it a +1 so others can benefit as well!